Most of you probably have a little idea how the eye works. The retina contains two types of photoreceptors, rods and cones. The rods are more numerous, some 120 million, and are more sensitive than the cones. However, they are not sensitive to color. The 6 to 7 million cones provide the eye’s color sensitivity and they are much more concentrated in the central yellow spot known as the macula. In the center of that region is the “fovea centralis”, a 0.3 mm diameter rod-free area with very thin, densely packed cones. However one scientist named Ignacio Provencio found in 1998 a new photoreceptor called Melanopsin. 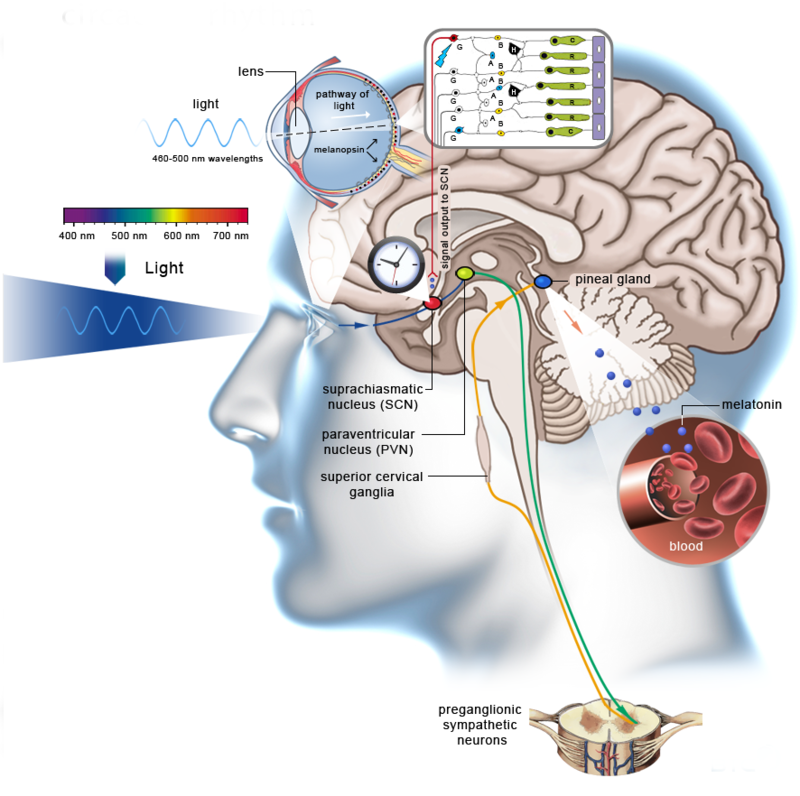 It has been shown that Melanopsin regulates a wide range of non-visual functions, such as the synchronization of the circadian rhythms and the sleep-wake cycle with the light-dark cycle. Studies show that exposure to blue light a couple of hours before bedtime actually suppresses melatonin and delays deep REM sleep significantly. So cutting back on tech use at night means getting better sleep, making people more productive at both work and school. We all know that light can be both harmful and beneficial for our vision and our overall health. Natural sunlight contains both UV and blue light. We all know the dangers of UV or Ultra Violet light and we often wear sunglasses to preventlong term damage. But, what do we know about Blue light? Blue light, which is part of the visible light spectrum, reaches deeper into your eye and its cumulative effect can cause damage to your retina and it is connected to the development of age-related macular degeneration. Blue light is not just entering your eye from natural sources like the sun. 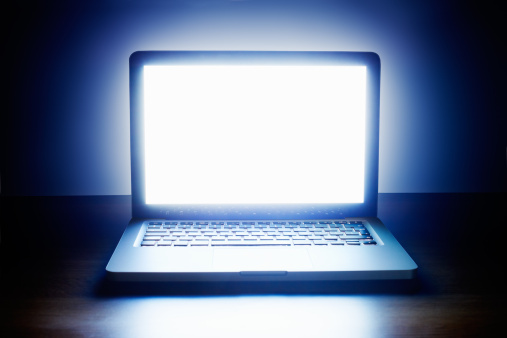 Our eyes are also absorbing blue light for digital sources on a daily basis. Over time, our eyes are exposed to various sources that emit this blue-violet light in LED lighting, tablets, TVs, computer screens and smart phones. There’s no doubt ourexposure to blue-violet light is on the increase. This cumulative and constant exposure to the blue-violet light is going to accumulate over time and has the potential to cause damage to the retinal cells, which is going to slowly lead toretinal cell death and can in turn lead to Macular Degeneration. Enough science. Now I’m going to present to you several solutions to the harmful effects of blue light. Well this is kind of a strange advice, but good for some people. 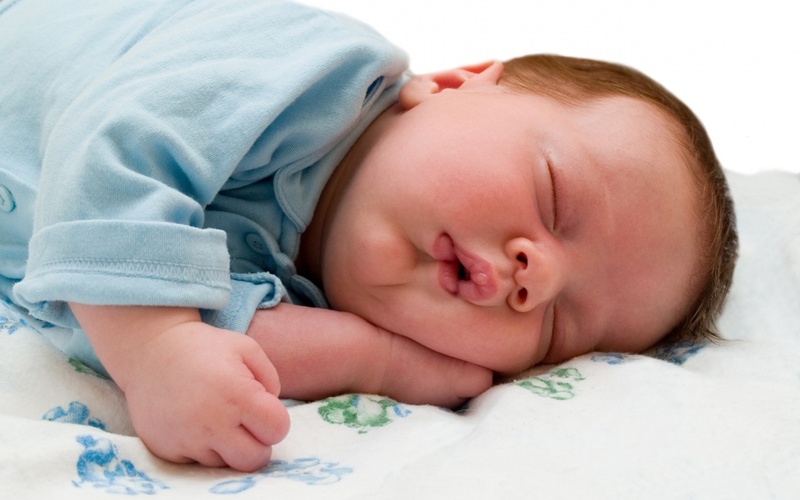 If you like to go to bed early and it’s OK for you to give up computer and devices do it. However for many people like me who work late at night, for programmers and for any individual who must use computer for many hours per day this is a bad advice. We simply cannot do this. There are several like this on the market. Basically this are some orange glassesthat you put on your face and they just absorb blue light. It’s a solution for somepeople also. If the glasses look good why not. It will help for sure, but the fact that they are just glasses means that your image will always look the same. At Iris we think this is solution, but not the best one. If you are the kind of person who likes to wear glasses, then OK, try maybe you will like this. The good thing about glasses is that they reduce every kind of light from your TV, computer, phone and etc. The bad thing is that you will always get one level of reduction. You can never customize the amount of blue light your eyes get. The truth is that blue light is not toxic and not always bad. Remember that we have a Sun over us that radiates it constantly. This is what Iris does. It enables you to customize your screen temperature and the amount of blue light your eyes get. 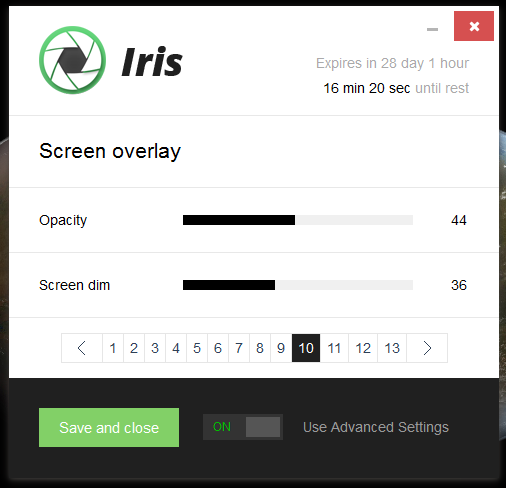 Iris hooks to the graphics pipeline and enables you to reduce the blue light on your monitor backlight. For us this is the best solution, because it is highly customizable. You can make small and super big blue light reduction. Choose what best suits you. Iris also uses your position to automatically adjust screen temperature based on the time of the day. Cooler display during the day and warmer at night. Notice: There is a bit of confusion about cooler and warmer color temperature. First of all color temperature is measured in Kelvins(K). Cooler temperature means higher value like 6500K (No blue light reduction) and warmer means lower values like 1900K (Candle light). After we present several different alternatives for blue light reduction we will talk about Iris. What are the available features and how to use them. What you can do with Iris? 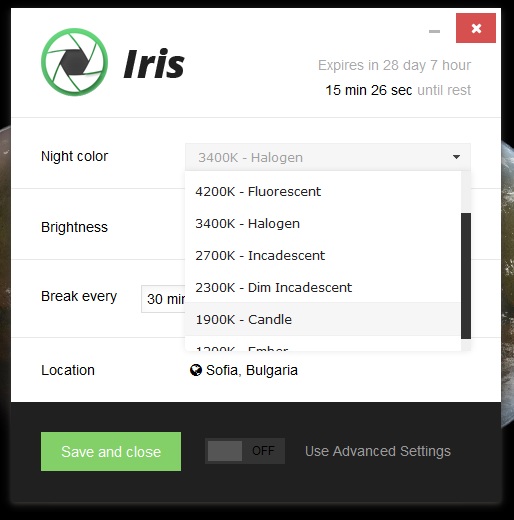 One of the main features in Iris and our main focus for now is blue light reduction. We have 6 whole pages of settings for blue light and this is a lot. Maybe too much, but these were all features that you needed and we added them. And maybe we will add more. the time will show. 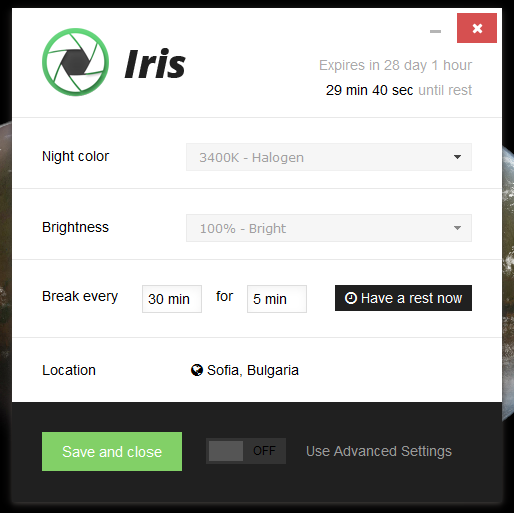 By default Iris will use automatic color settings and manual brightness. The default value for night color is 3400K(Halogen) and during the day 6500K will be used. Brightness is set to manual by default, because it should match your room lightand we still haven’t implemented automatic light detection. You can setautomatic night brightness and during the day 100% will be used. Simple view is used by default and there you can find the types of night colorthat you can set. The first thing you are going to find in the Advanced settings is the Color section. 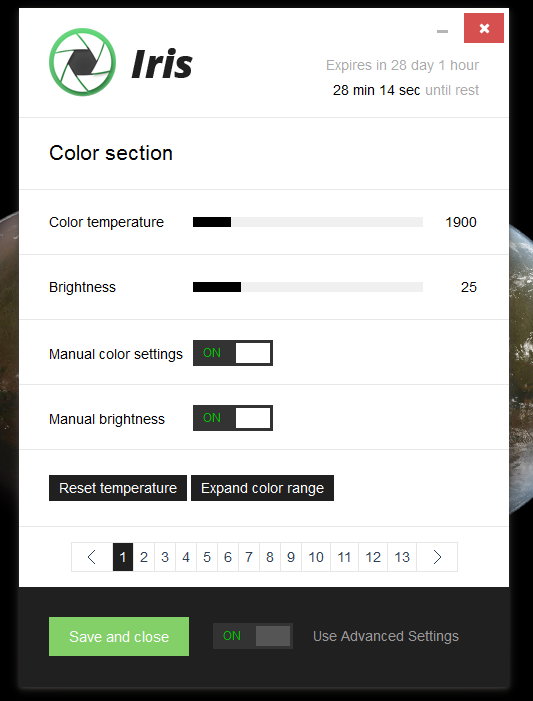 From here you can customize brightness and color temperature. There is aColor temperature slider with bigger range and more values. It goes down to1000K for the moment. If Manual color settings is set to ON your color temperature will be constant the entire day. Color temperature value will be used. By default when Iris starts it will save your current color settings and then restore them. This was requested by several users who used Catalyst control center for color correction. 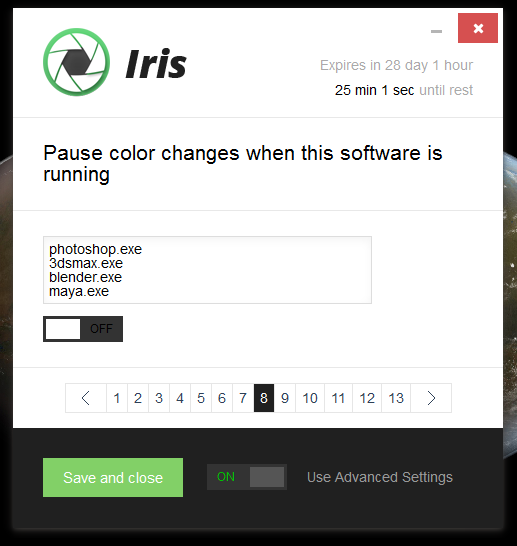 If you press Reset temperature Iris will clean this saved presets and when you close Iris, it will reset your computer to default settings without color correction. If Iris is the first color correction program you have used chances are that Expand color range button will be shown. If Expand color range button isshown the dropdowns and sliders will have limits. This is because your systemdoes not support big changes in the color profiles. Press Expand color rangethen Restart and all values will be unlocked. 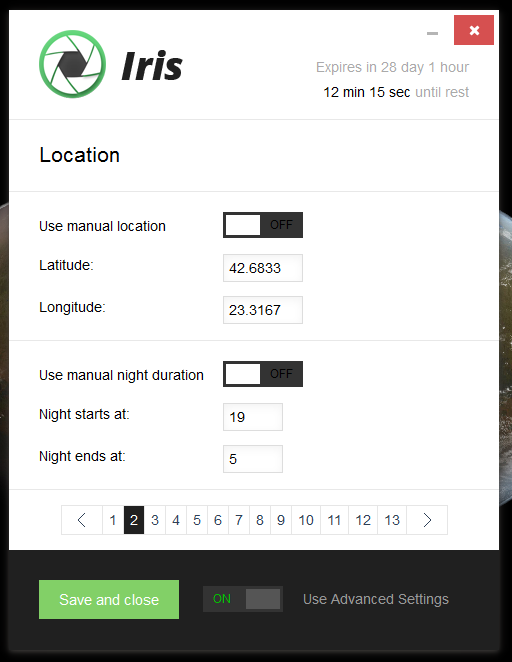 From the Location tab you can set custom Latitude/Longitude pair or hours forstart and end of the night. If you want to use Manual location or Manual night duration remember to set the slider to ON. If the 2 sliders are set to ON Manual night duration is used. Notice: By default if you have Internet connection Iris will find your locationautomatically and will save this location for later use. This is the automatic location feature. Color graphs are the king of customization. 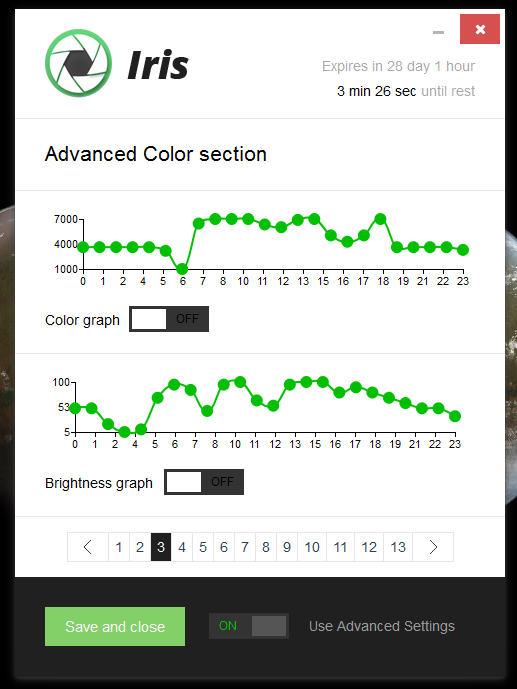 From here you can set Color temperature and Brightness for every hour of the day. This is probably too much for some people, but other people like this feature. Use them if you are the kind of person who likes ultra customization. Use Ctrl+Alt+Home to activate Screen Overlay. Use Ctrl+Alt+LMB to select part of the screen. LMB = Left Mouse Button. Drag for selection. Use Ctrl+Alt+End to deactivate Screen Overlay. 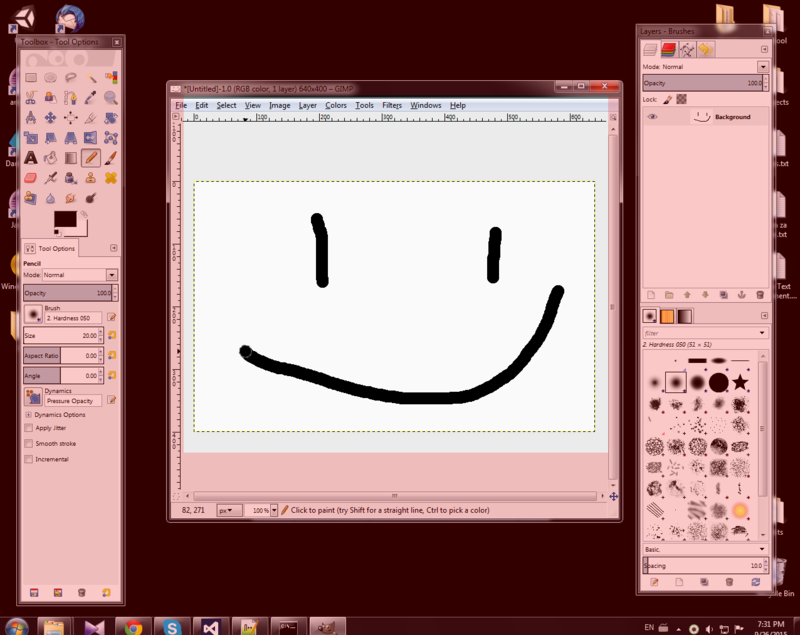 I am using Iris Pro for some time. It is an extraordinary health software. Apart from Blue light, can Iris also reduce UV light? Is there any mode or setting for this purpose in Iris Pro? There are eye glasses intended for blue light,uv light protection and anti-glare. Will it make a difference? Should I also wear this eye glass with Iris in usage?